Access: Sanca Creek Road, 17.6 km gravel road from Hwy 3A to trailhead. A 2wd vehicle could be okay with careful driving, but high clearance is better, particularly for the last 2 kilometres. Rating: Easy to the small, marshy, but scenic lakes below Haystack Mountain. Moderate to challenging up to the peak, depending on your route. 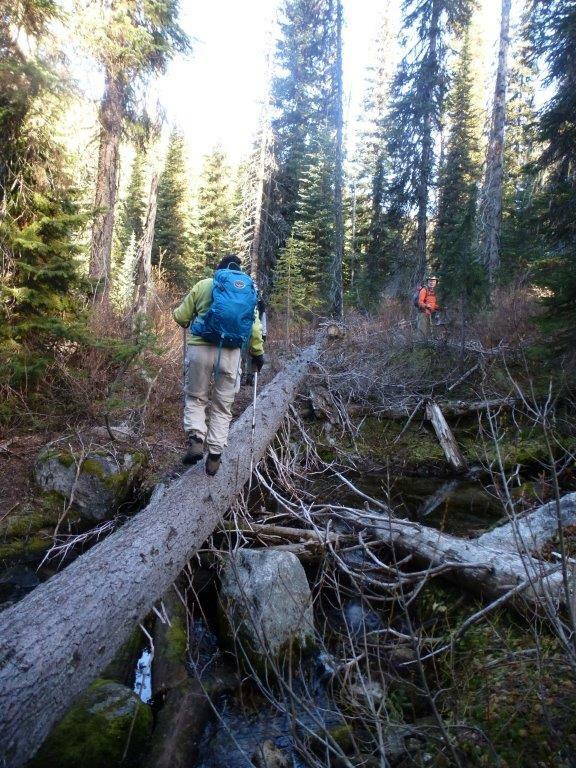 A number of decaying log bridges across waterways along the lower part of the trail may be challenging for some hikers. 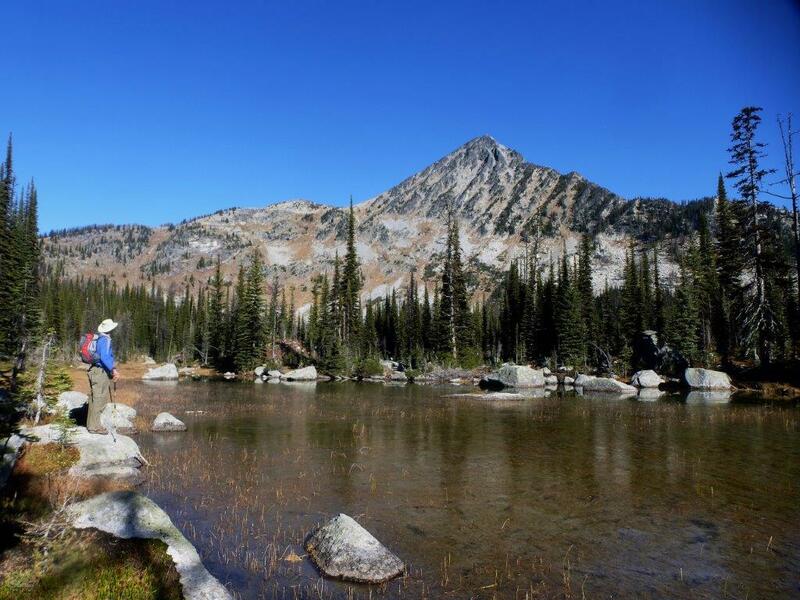 Hiking Time: 4 hours return to lakes, 5- 6 hours return to saddle below Haystack peak, 6-8 hours return to summit. Distance to summit 4.5 km, elevation gain 1010 metres. Driving: Kilometre 0 is at Sanca Creek Road, just north of Sanca Creek Bridge. This good gravel road follows the Sanca Creek ravine deep into the Purcell range, and the main road is fairly obvious. Keep straight at 2.8 km, stay left at 9.5 km, and proceed straight at 9.8 km (where a 10 km sign may be visible.) At 14 km keep right, where the road is signposted for Haystack. At 15.6 km the road turns right, crosses a bridge, and becomes steeper and rougher. Reach the trailhead parking at km 17.6 (1673 metres elevation). 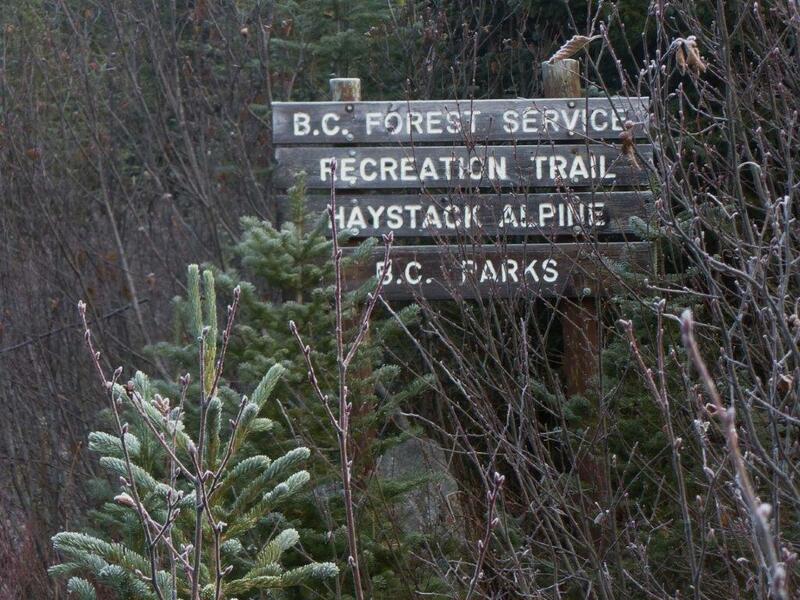 Be sure to sign in at the trailhead, to encourage forestry and BC Parks to continue to maintain the trail. The mountain peak dominating the view east from the parking area is not Haystack, but Craig Peak. Haystack does not become visible until you are very close to the lakes. Hiking: The trail, leading you generally NE through fir forest, is distinct though rocky and narrow in places, with a moderate ascent and some rock-hopping and log balancing across small waterways. There is a lovely wooden bridge across Sanca Creek after about 10 minutes’ hiking. About halfway up the trail you will cross the boundary into Kianuko Provincial Park. The trail becomes steeper. 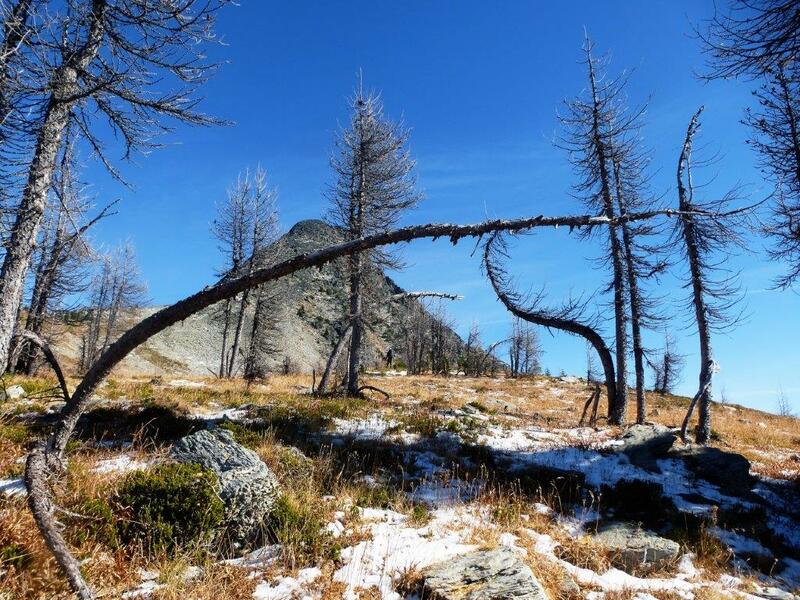 After about 1 ½ hours’ hiking, you will reach the first lake. Some hikers will be happy to picnic here and then return. You may wish to wander along farther, to the right side of the first lake, or north towards Haystack Mountain on the left side through the marshy meadows. 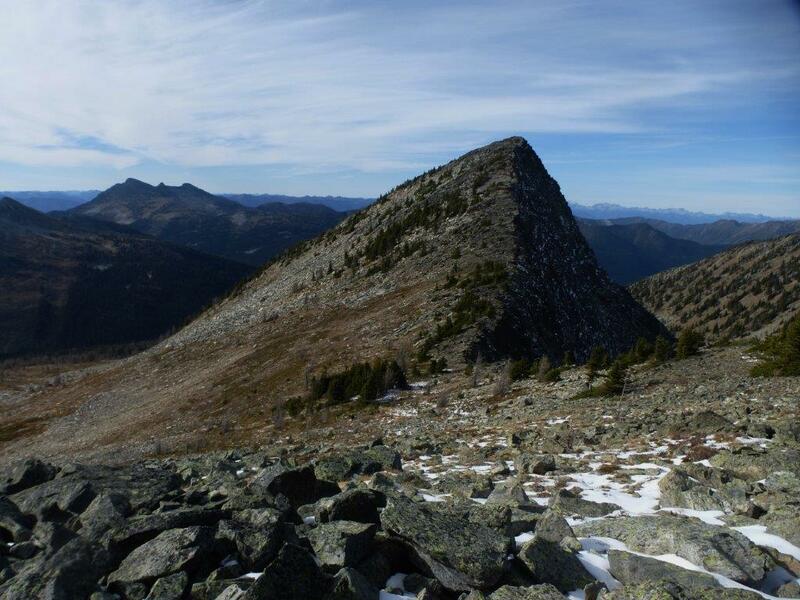 For a more exciting hike you will want to ascend to the peak of Haystack Mountain, or at least to the saddle to the left (west) of the peak. One way is to make your way straight towards the saddle and find a route up one of the grassy chutes. These are steeper than they look and require using hands as well as feet to climb. You may find yourself partway up and then wish you hadn’t started. However for the strong and adventurous, this will be the quickest route. A safer, easier route is available, and also leads through beautiful scenery that chute-scramblers will miss. Follow the path to the left of the first lake, aiming north towards the Haystack saddle. The path meanders gently through marshy meadows. Before you quite reach the end of the meadows, go left (west) into the trees, so that you are now travelling roughly parallel to the long western ridge that leads up to the Haystack saddle. You may find a flagged trail, but if not you will still get there. After a short jaunt through the trees you will re-emerge into more meadow areas with a small creek trickling towards the basin that you just left. Continue to travel parallel to the ridge. By now you should be able to locate the low point of the ridge, a distinct notch that is at the top of a rocky chute. You may be able to follow a flagged route all along this section to the rocky chute. 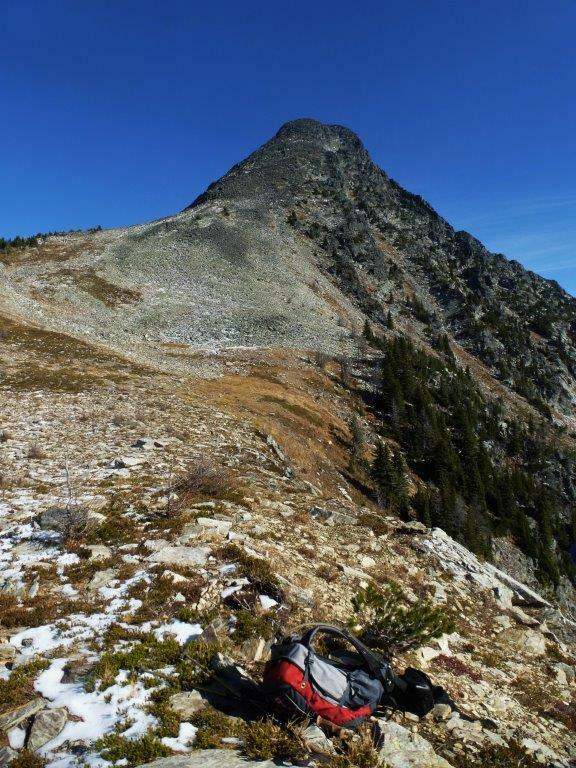 Be aware: another rough trail has been flagged that will also get you up on the ridge, but for the best and most travelled route, aim farther along towards the notch, and keep going generally west . Towards the end of this easy, fairly level walk (just 10 to 15 minutes from the lake) you will find yourself facing a formidable looking wall straight ahead (west). To your right (north), find a large cairn near the bottom of the avalanche of rocks cascading down from the notch. A well used, flagged, switchbacking trail leads steeply upwards on the right side of the rocky chute. Once up on the ridge, just follow it back (east) through somewhat steep but pleasant sub-alpine terrain towards the saddle. From the broad, grassy saddle, there are satisfying views of the lakes below and the surrounding peaks. A further 40-50 minute scramble up the black heap of chunky rocks that form Haystack’s peak will bring you to fabulous 360 degree views at 2683 metres elevation. Watch out for loose, unstable rock. A note: There is often a large amount of run-off on the lower Haystack trail in the spring, resulting in sections of the trail turning into creeks and some of the many bridges being washed away or damaged. The general wetness of the area also promotes healthy populations of mosquitoes. For these reasons, locals advise that the optimal time to visit Haystack is usually in the second half of summer or in the autumn, when the mosquitoes have subsided, the water has stopped raging, and park or forestry staff have had time to do some repairs. These conditions will of course vary from year to year.